What skills do researchers need to make open science become a reality? How could these skills be trained and what else does it take? A recently published report of the Working Group on Education and Skills under Open Science contains a set of recommendations. 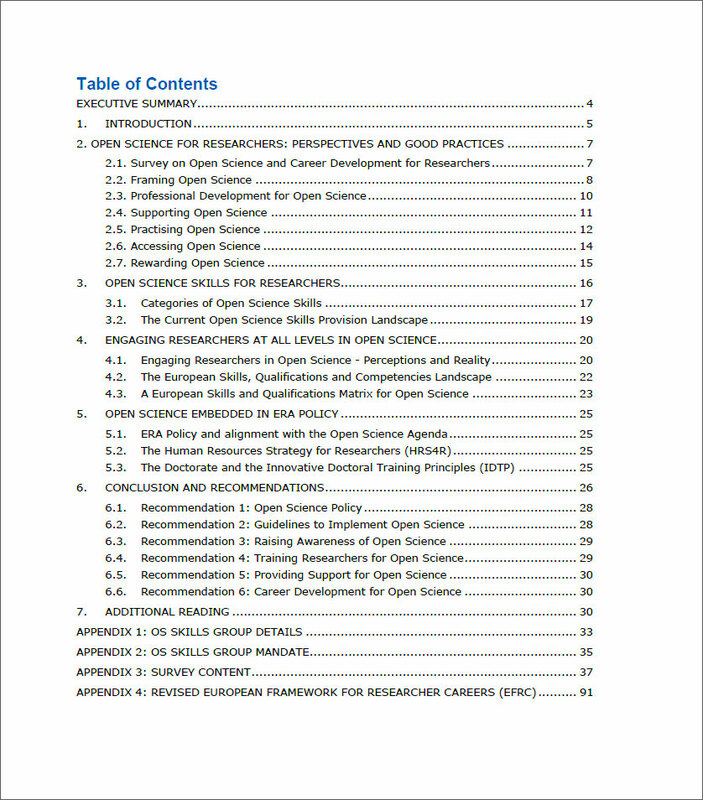 The recently published report “Providing researchers with the skills and competencies they need to practise Open Science – Report of the Working Group on Education and Skills under Open Science” addresses skills researchers need, how those skills could be trained and what else is needed to push open science practice. A survey, conducted between March and May 2017 to assess the current situation, forms the reports’ basis. The survey answered by 1,277 researchers across Europe revealed that the concept of open science is unknown to a majority of researchers. At the same time, open access publishing is the most known open science practice among them (three out of four researchers say that they know ‘a lot’ or ‘some’ about it). They also show a very high interest in open access data management practices. On the contrary, a considerably smaller percentage of researchers knows about other open science practices such as open peer review, open education, citizen science and open notebook. Even though open access publishing is relatively well known, a large number of the researchers who completed the survey, are not practicing it, or do not know whether they do it. Taking into account the general lack of awareness of open science practices revealed by the study, this is not that surprising. The survey also showed a lack of training and awareness concerning research data archiving. For instance, more than a quarter of the surveyed researchers does not know what will happen to their data, if they leave their institution. Furthermore, nearly two thirds answered they do not provide accompanying metadata with their research data, and those researchers who do provide metadata mostly do not apply institutional or disciplinary standards. Although applying the FAIR data principles for research output is an important cornerstone of open science, researchers’ little consciousness of data archiving practices is a threat to its advancement. Therefore, standard metadata guidelines are essential and should be mandatory for institutions and skills training courses. Matching these findings, researchers are largely unaware of international Open Science initiatives, like the FOSTER project, Open Innovation, Open Science, Open to the World, and the European Open Science Cloud (EOSC). The lack of awareness also encompasses the policy of the researchers’ institutions and of funding bodies. Almost half of the researchers do not know if their institution has guidelines for open access publishing. When it comes to their funding, only a minority of researchers is aware of the existence of open access publishing guidelines. The researchers’ answers indicate that either training opportunities for open access and open data are not yet widely offered or that they are not aware of those existing training opportunities. Nevertheless, most researchers who have not yet, would like to participate in open access or open data courses. The report states that there is a general shortage of appropriate skills training and guidance for researchers. Therefore, it has to be ensured that researchers at all career levels are offered tailored professional development opportunities that enable them to fully practice open science. for citizen science and interacting with the general public (learning how to engage with citizens, how to communicate with stakeholders other than the academic scholarly community to facilitate a better user involvement and dissemination of research results). How could open science skills be trained? The report emphasises that the majority of researchers would like to follow open science skills courses. More courses and on the other hand more awareness of existing courses is needed. Therefore, “Training Researchers for Open Science” is one recommendation in the report. For instance, it should be mandatory for universities and research organisations to offer open science skills training courses. The report shows that there are already a large number of stakeholders in Europe offering training of open science skills. Currently these activities are not well coordinated, therefore fragmentation and duplication might by important issues and should be addressed with greater coordination efforts. The European Commission could take a lead to promote the standardisation of a set of recognised skills, competences and supports. When it comes to training formats, taking into account individual learning styles and different disciplines is essential. Survey respondents preferred opportunities for skills development through actual practice over training courses. Especially in the areas of collaboration and networking, research publishing and dissemination, teaching and supervision, research and data management, research integrity, and popularising science for the general public ‘learn by doing’ seems to offer adequate learning opportunities. From the researchers’ perspective support for open science is lacking in their institutions. 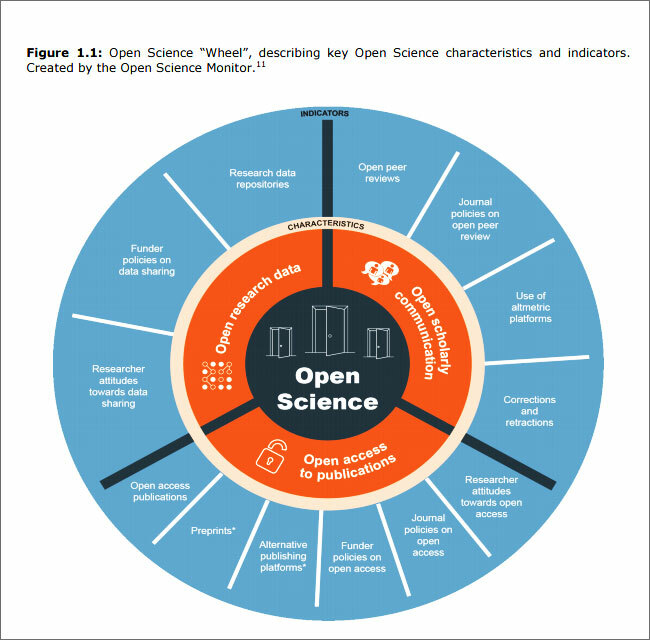 “Providing Support for Open Science” is, therefore, another recommendation in the report. This recommendation includes infrastructure, technical, legal, professional and implementational support from institutions. Especially, providing a physical infrastructure for storing and curating publications and data is crucial to foster open science advances. Hence, the report states that the development of the European Open Science Cloud is essential. Also, technical tools for researchers doing open science and a legal framework for the secure, legal, and ethical sharing of data are needed. Currently, the survey answers indicate that there is insufficient data archiving support and infrastructures at the institutional level. As stated in the report, developing and growing the cohort of information professionals (which include librarians and data scientists) needs particular attention. Also, support staff with the detailed expertise on data and software management is required, and institutions must have staff equipped with the necessary expertise to act as data stewards. Data stewards are a new workforce supporting researchers. This leads to new employment opportunities for researchers. To fulfil their tasks, they need adequate training and need support themselves. For instance, they could be supported by setting up national institutes for data stewardship. Similarly, competencies and training needs for specialist open science librarians should be determined. Funding for the development and recruitment of these information professionals should therefore be provided. Beyond offering training opportunities and support structures, it seems useful to reinforce open science with additional incentives and rewards. First, awareness of open science has to be increased. Recommendation No. 3 included in the report is raising awareness of the value of open science on a personal and on a societal level to prepare a fertile ground for learning the appropriate skills. Part of this is the awareness of open science policy initiatives, existing guidelines as well as existing training opportunities. Second, another recommendation of the report is “Career Development for Open Science”: learning and practicing open science skills should be an integral part of professional training and careers development for researchers. It should, therefore, be rewarded by research funders and by institutions in the career evaluations of researchers. Open science policy is the subject of the first recommendation in the report. It demands science policy stakeholders to take action in order to mainstream skills for open science. Thus, policies should be updated to make sure compatibility of tools already in place with open science and to make the existing open science-related elements explicit. This will result in a clear policy alignment for open science and will provide clarity to policymakers at the national, funder and institutional level as well as to researchers themselves. Open science skills should be made an integral part of the Work Programme 2018 – 2020 and also of the next Framework Programme (FP9) with dedicated funding. Also, a call for proposals should be part of the H2020 programme “Science with and for Society” (SWAFS) to fund RIA (Research and Innovation Actions) and CSA (Coordination and Support Action) activities concerning the development of open science skills. In addition, funders on European level as well as on regional and national levels and private foundations should require access to open science skills training as mandatory for all researchers funded through their programmes. “Guidelines to implement open science” are addressed in another recommendation. Among the steps recommended are the following: adapt existing guidelines on research careers and training on European level to integrate open science. Developing integrated open science roadmaps on national, regional and institutional level available to all students, researchers, and staff that address the requirements for the effective practice of open science in a coherent way is encouraged. The development of FAIR institutional guidelines, particularly for open access and open data, is mentioned as a part of this. The survey results cited in the report show that many researchers are to a large extent unaware of open science policies and practices, and are in need of more skills training and support, as well as incentives to begin, and continue to practise. Nowadays, this hinders open science becoming a daily researchers’ practice. The report points out the different options very well, although the focus is too much on the researchers themselves rather than on the enabling environment for open science. New professions like data scientists are listed, but it would have been another added vaule of the report to go into details what skills exactly are needed in the whole research cycle. Furthermore, the report highlights the different options of training (supply), but too little attention is paid to the relationship of skills and the reputation system (demand). As long as the reputation system is not reformed in parallel, the interest and willingness for the training options will be moderate. Synchronising the results of this report with for example the work of the European Commission Expert Group on Altmetrics and its publication “Next-generation metrics: Responsible metrics and evaluation for open science” will help to prioritise the planned actions. Finally, we welcome the Working Group´s ambition to formulate European standards for open science training. However, we would like to stress that these steps need to be taken carefully. The open science movement is driven bottom-up and too much top-down interference might have unintended consequences. Furthermore, there is still too little evidence which of the existing options are the best to train open science. More analysis on the effectiveness of different training options have to be done to formulate, based on the best practices, European standards.